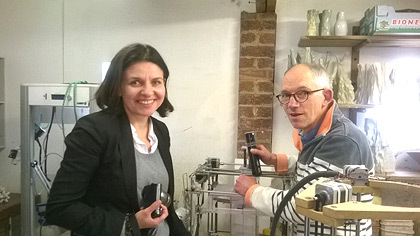 While in Limoges I was very keen to visit the ceramic printing company 3D Ceram. 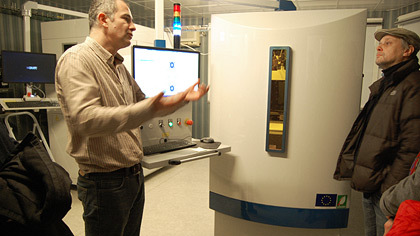 They have developed a laser stereolithography process for printing in ceramic. Similar to all ceramic 3D printing the form is built up layer by layer but rather than extruded layers or layers of powder that are bonded with an inkjet type process 3D Ceram use a thick clay paste that is wiped back and fourth across the build platform and the positive shape fused using the laser beam. Although small in scale the quality of their products are astounding. As with so much additive manufacturing they have yet to find their real growth area but they had interesting samples of printed ceramic for health, biomedical, engineering, industrial and their current growth area fashion and luxury. Top: 3D Ceram's laser stereolithography ceramic paste 3D printer. 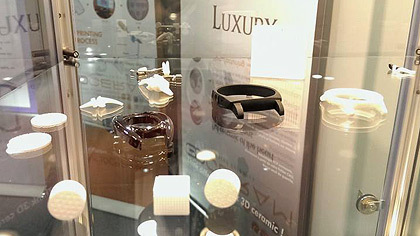 Middle & bottom: Luxury object - ceramic jewelry and watch surrounds. 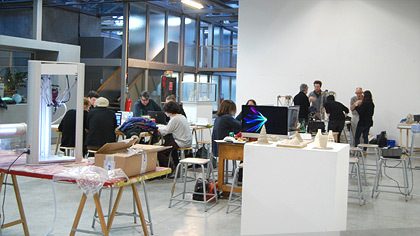 Entitled ‘Ceramics as Experience’ this is a new course set up at ENSA, the French National School of Art in Limoges. 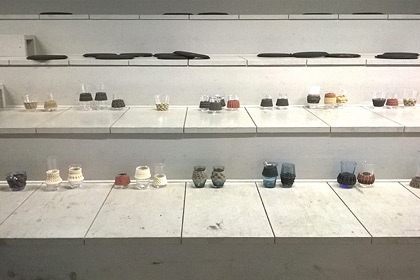 Initiated by artist Michel Paysant with support from curator and ceramic historian Wendy Gers it has been modelled as an artistic laboratory of research. 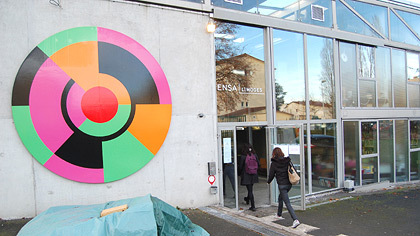 The ambition is to promote contemporary creative crossover between art and design and to experiment with and reflect on theoretical and scientific research. The laboratory aims to establish new relations between ceramic and the surrounding world, encourage new dialogues between artistic practices and researchers and to build collaborative projects at the borders of these two territories. To challenge the standards imposed by tradition and create work that surprises both the creator and the viewer. 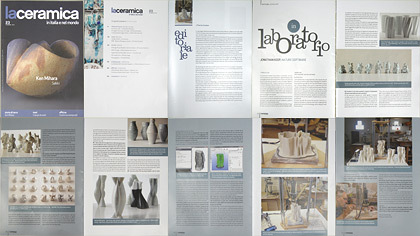 With the wishes to incorporate the current developments in the use of digital techniques into the laboratory I have been invited to run workshops around ceramic 3D printing. 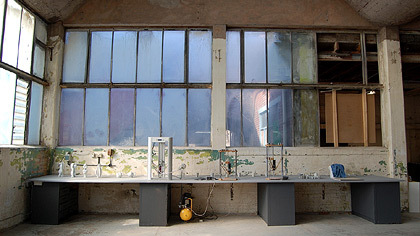 In the spirit of experimentation the brief is to develop an approach to working that is a hybridization of traditional techniques and new technology – a mix of tradition ways of working and digital tools. Curated by Sarah Myerscough in her recently relaunched gallery, now called Phos Art + Design this selection of works by established European contemporary ceramicists is the first of a series of curated ceramic shows aimed to present and promote the diversity and inventiveness of the current European ceramic scene. I have shown with Sarah on and off over the last ten years so I was pleased when she invited me back, but also asked if she could use one of my titles, "Random Growth" for the show. The ceramicists on show where selected for breaking away from the traditional functional vessel and moving towards sculptural form that challenge the boundaries between craft and fine art. In doing so these works push the limits of their material and processes of making to create striking and sensual objects, reinventing traditional skills while also exploring new techniques and technologies. I was delighted to have sold two works before the opening. 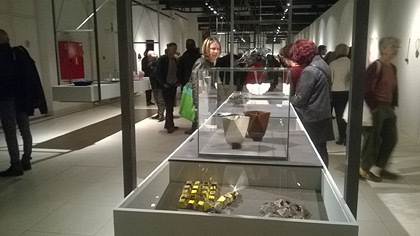 The exhibition showed British and European makers and there was a strong sense of form throughout - Gordon Baldwin, Karen Bennicke, Thiebaut Chague, Christina Schou Christensen, Cathy Coez, Michael Geertsen, Martin Kaldahl, Jonathan Keep, Anne Marie Laureys, Aneta Regel and Bente Skjoettgaard. Top image: My Icebergs, next to Christina Schou Christensen. Back left Michael Geertsen, back right Bente Skjottgaard. 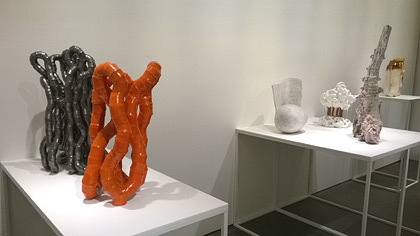 Upper middle: Left to right, Karen Bennicke, Anne Marie Laureys, Martin Kaldahl, Christina Schou Christensen, Halima Cassell, Cathy Coez. 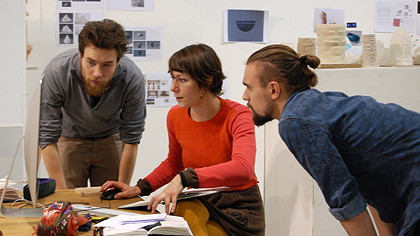 Bottom: Martin Kaldahl, Gordon Baldwin, Bente Skjoettgaard, Aneta Rege, Simon Carroll. 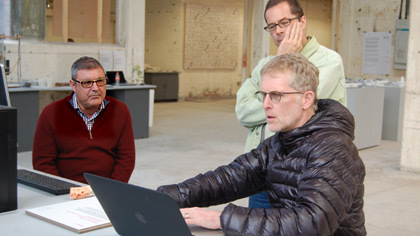 The final themed day of Michael Eden and my residency at BCB was an Industry Day. An obvious link as we were in the heart of the UK ceramic industry but I pressed for this as in my opinion the industry has been slow to look towards the future with digital techniques. Possibly understandable as there are few short term gains to be had but I am frustrated that small scale studio based concerns like myself are driving the development. Drivers are needed for the progression of a technology and if the industry stands back waiting for somebody else it is not happening - a long term view needs to be taken. 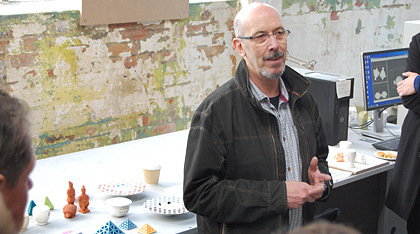 David Huson from the University of the West of England joined us to talk about the work his research group have done with industry and promote the ceramic printing burea, Argillasys that they have set up. 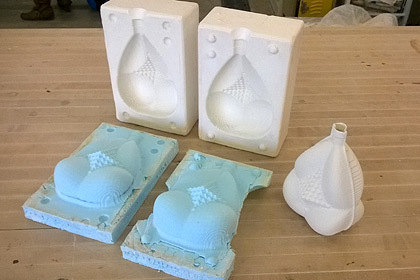 Powder printing and it potential for making complex geometries is too slow as a production method but certainly has possibilities for industry prototyping. I am delighted that Wade Ceramics of Stoke-on-Trent are interested to see if extrusion printing, as I do can be used in their manufacturing process so I am interested to see where this might go and we are in further conversation. 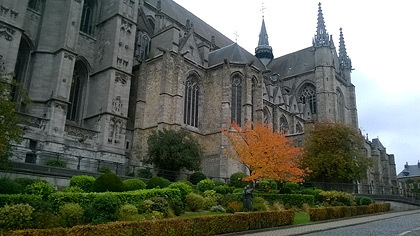 As current hosts to the World Craft Council - Europe, Belgium held the 2015 European Summit of Applied Arts in Mons, the present European Capital of Culture. 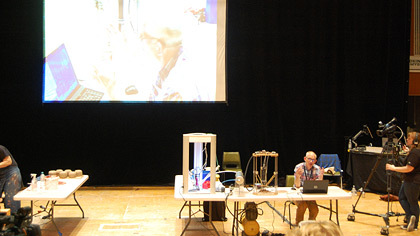 Consisting of a number of events that included exhibitions, a festival of film screening, master classes there was a two day seminar around the theme of Crafts and Technology. I was invited to present a paper and chose the title ’New Tools in the Tool Box’ talking about how any honest creative endeavour should reflect the time in which it is produced and living in the digital age it is inevitable that computation will influence making. Also that it is not either or, tradition or technology but digital tools offer new ways of working that are an addition and not a threat. The symposium was well chaired by Vlad Ionescu with other fascinating presentations by Annie Warburton of the UK Crafts Council offering and overview of craft and technology, David Huycke talking about his jewellery, Bradley Quinn a specialist in smart textiles, biotech, wearable technology and sustainability and finally Finnish researcher Emmi Maijanen talking about using laser technology in the arts. 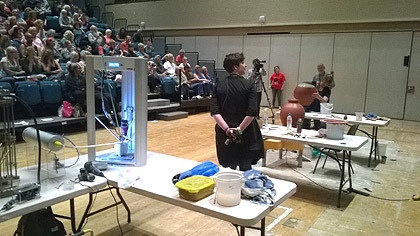 Organised by the North Staffordshire branch of the RIBA this one day symposium explored the current and future role of 3D printing in architectural design and construction with special reference to the use of clay. In the morning Michael Eden and myself presented the work we had been doing while in residence at the biannual exhibition. An afternoon lecture program followed with presentations from Architect and educator Peter Ayres, ceramic architecture specialist at Arup, Peter Webb, Michael Eden talking about his work and architectural collaboration and myself talking about the Italian WASProject and their ambition to 3D print low energy buildings using local materials. 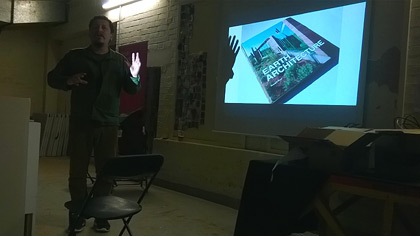 Key note speaker in the evening was Ronald Real, San Francisco based architect, educator and author of Earth Architecture. A fascinating presentation, not only did he go through the architectural work he and partner Virginia San Fratello have done but also the extensive exploration of 3D printing documented under Emerging Objects. 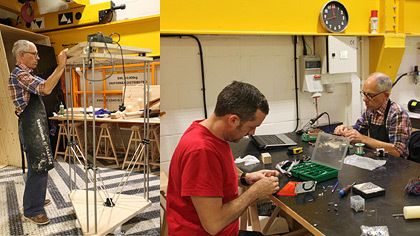 The Institute of Making, University College London’s MakerSpace and Materials Library invited me to do a weeks residence and to build a large version of my Build your own Ceramic 3D Printer. 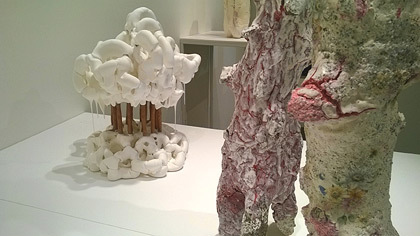 The Institute has been focusing on clay as a material over the Autumn. 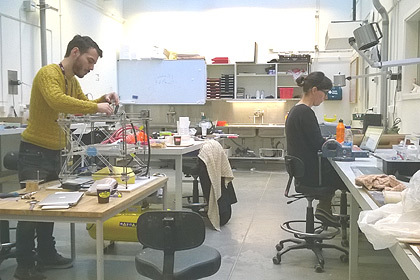 Set up as a cross-disciplinary research club or lab for UCL students and staff interested in the made world it is a really interesting establishment with fascinating people passing through - one of the most exciting developments I have seen in the current revival of interest in making. As I was also demonstrated during my stay I ran out of time building the printer leaving a working but incomplete printer that I will have to return to. 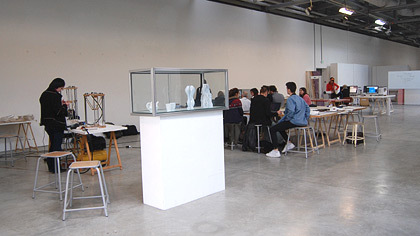 RElab, the Fablab in Liege invited The Transaction Project, the glass/clay collaboration between Charlie Stern, UNFOLD and myself to participate in the ‘Meeting Point’, an exhibition that focused on design and 3D printing. 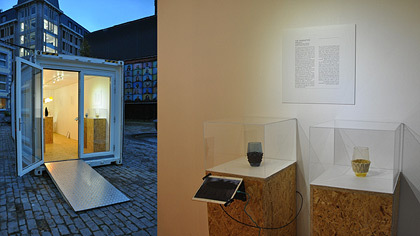 Staged in a sea container positioned in the heart of the city centre the exhibition was part of Design Liege’s Triennial festival RECIPROCITY. 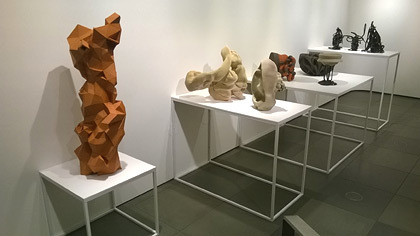 Initiated by artist Michael Eden this was a chance to explore the current state of ceramic rapid-prototyping, 3D printing, additive manufacture, call it what you want during the British Ceramic Biannual in Stoke-on-Trent. Michael and I undertook periods of residence in the exhibition hall working with and demonstrating our two different technologies of ceramic printing. Michael persuaded USA based 3D Systems to loan one of their powder based printers and I provided the WASP and my DIY extrusion type printers. I should think this was the first time the two ceramic printing technologies had been run with such intensity side by side. Boston based Andrew Jeffery, pioneer in ceramic powder printing and business partner and ceramic artist Forrest Snyder, both now of 3D systems came out to set up the powder printer during the opening weekend that made for a rewarding transfer of knowledge between them Michael and myself. Andrew and Forrest co-founded Figulo Corporation that 3D printed ceramics for consumers, businesses, artists and designers and was bought out by 3D systems who also bought out Z Corp the powder printer currently used for ceramic powder printing. 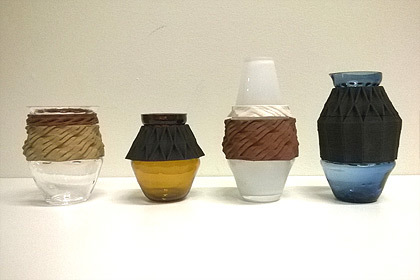 Antwerp design duo UNFOLD were invited to participate in the Cheongju International Craft biennale so showed L’Artisan Electronique, the digital potter’s wheel and The Transaction Project, the glass/clay collaborative project . 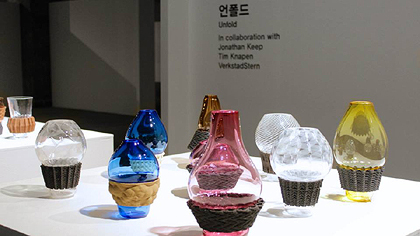 The Transaction Project has evolved from the initial collaboration in Sweden of Charlie Stern, UNFOLD and myself to include work from Bornholm in Denmark and Charlie and UNFOLD worked with a glass artist in Korea. While visiting WASP in Italy I got to see the article Matteo Zauli of the Zauli Museum, Faenza had published in the December copy of the LaCeramica magazine about my work. 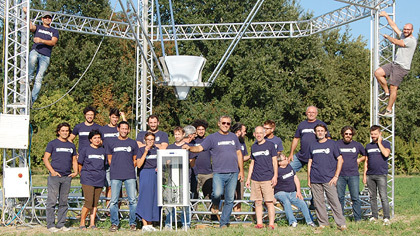 I spent a long overdue week working at the WASProject facilities in Massalombarda just south of Bologna. 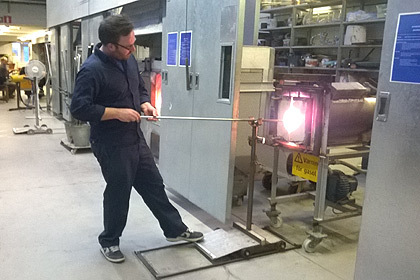 Initialy feeding back my experiences of working with the ceramic WASP 2040 DELTA that they had given me to trial back in October 2014 I then also worked in the ceramic lab. The WASP printer has hugely helped my work in the volume of what I can print and the precision and quality of the making. It will easily run for 6 hours trouble free producing a print. My reservations have been in the design of the retractable printhead for maintenance. If not used for a period the clay hardens in the printhead requiring dismantling and cleaning that is currently not very easily done. This was a good chance to catch up with all the activities WASP are doing and to exchange thoughts and ideas. 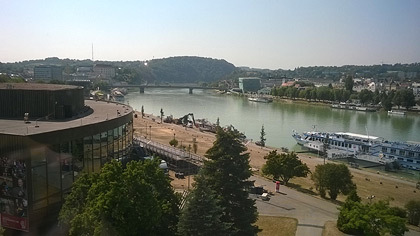 I was a week early for the festivities planed for the launch of the 12 meter BigDelta but I saw it coming together. 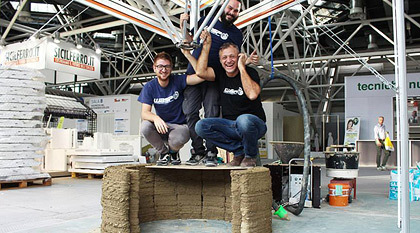 Massimo Moretti, driving force behind WASP has a dream to print houses using local materials and with minimum energy use and he is well on the way to achieving this. The Elements of Art and Science exhibition includes works that demonstrate the varied approaches and methods artists are using when dealing with scientific subjects. The aim is to establish interconnections among diverse fields of knowledge to provide alternative perspectives that will foster the emergence of new ideas and developments. 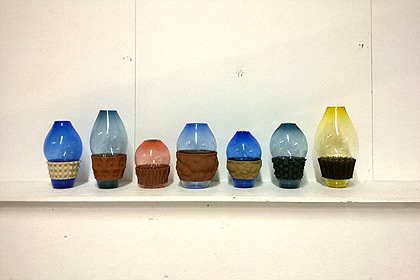 I have a group of vases and Seed Bed in the exhibition. Seed bed relates to the fundamental concept of evolutionary morphologies but also creative growth. Generated in computer code the working method lends itself to altering the code to make related and evolving shapes. 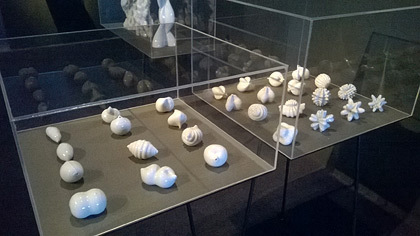 Being able to 3D print these unique and individual forms directly from the computer in clay represents the strength of this technology. I want this work to speak of the development of ideas as much as form. ‘Crafted explores this moment of flux in the field, focusing on contemporary craft-based artists who bridge cutting-edge concepts and traditional skills as they embrace and explore the increasingly blurred boundaries between art, craft, and design. Featuring a selection of works from across the landscape of contemporary craft, the exhibition includes more than 30 emerging and established international artists’. 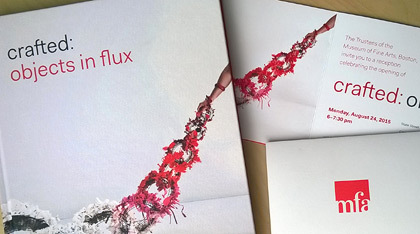 There is a fine publication accompanying the exhibition written by curator Emily Zilber. The exhibition includes my ‘Sound surface - Benjamin Britten 4 Sea Interludes from Peter Grimes’. While generating the computer mesh I progressively textured the surface by adding digital sound recording. The surface from base to rim becomes a representation of the tone and rhythm of the music named in the title of the pot. 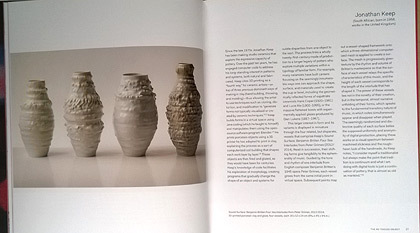 I have used one prescribed virtual vase shape so each form starts the same and the length of the musical interlude defines the height and the forming code effects the shape and surface. The rhythm and volume of each interlude changes the texture and basic shape so the character of each vase can clearly be seen. I accepted the invitation to be a demonstrator and present a lecture at this year’s festival with a mixture of excitement and apprehension. Excited to be involved in such a well established event but anxious as to how the use of computer technology would go down with an audience who on the whole like to get their hands stuck in. I did get the questions like do I not miss felling the clay, do I not miss throwing - as though that is the only way to make pots? I guess in this situation it helps that I do have a studio pottery background and so I can answer with life experience. Most rewarding was that by the end of the weekend I had many a warm comment that although they would not be using computers in their own ceramics I had successfully managed to explain and demonstrate that there is a place for new digital techniques in ceramics. Obviously there were also a small number, mainly younger festival goers, a demographic the organisers are trying to grow who were delighted to see what I was doing and like myself are just non plusses by the resistance to digital techniques in ceramics. I have worked in eleven other countries recently and some three or four times I do find the UK to be the most resistant to the thought of a computer in the pottery studio. 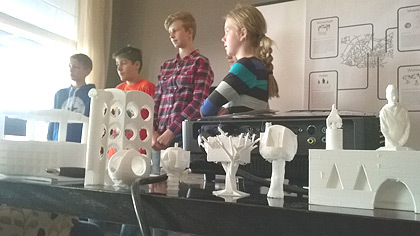 The last of the 3D Comenius meetings was held in Leeuwarden, northern Netherlands. 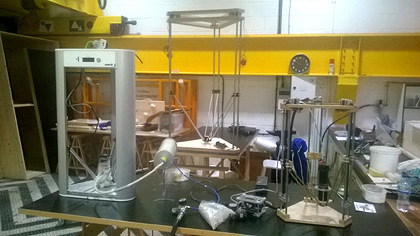 This has been a two year EU funded project looking into how 3D printing will be used in schools. 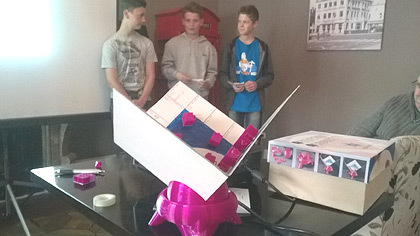 Six school took part coming from Sweden, Germany, the Netherlands and the UK. Based around 3D thinking and the use of new technologies each school had a designer associated with them and I have been working with Alde Valley Academy here in Leiston. The project has been inspiring and frustrating in about equal measures - inspiring to see the excitement and imagination stimulated in the students, frustrating in that schools are finding it technically difficult to implement. The plan is to continue the project after a year’s break by which time it is hoped that at the speed these new technologies are progressing it will be more school user friendly. In my view the problem is not so much the machines, the 3D printers they are improving but it is how to generate 3D content. User friendly software for schools is needed. There are very good starter programs such as Tinkercad and other 123D apps but they are limited and we are crying out for an intermediate 3D modeling software. As a great supporter of the Open Source Blender 3D modeling software I would like to campaign for a ‘Blender Light’ – any software developers out there. 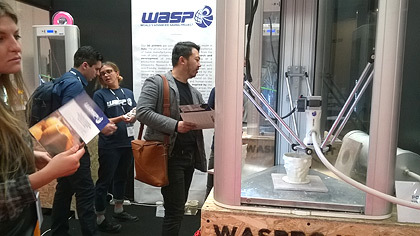 WASP the Italian group who make plastic and ceramic Delta 3D printers again had a stand at this year’s London 3D PrintShow so I joined them to help demonstrate the ceramic printer. 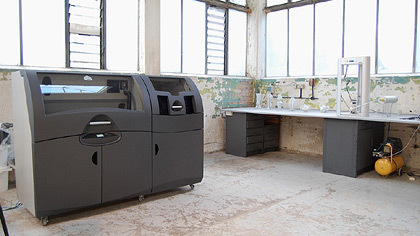 (The same model of printer they have given me to trial in my studio) The last 3D PrintShow I took part in was in 2012 so it was interesting to see how things have developed. I do think the bubble has burst with regards the enthusiasm there was for home 3D printing as people find it is not so easy and then what do you want to make in plastic! 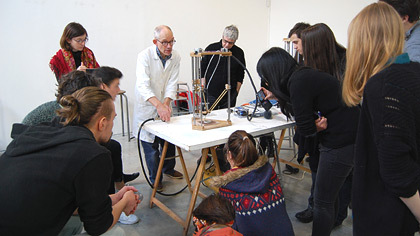 Professor Enrico Coen from the John Innes Centre in Norwich had requested that he bring the members of his lab for a studio visit and if I would then do a workshop with them. The Lab specialises in plant development and evolution with special relationship to form. 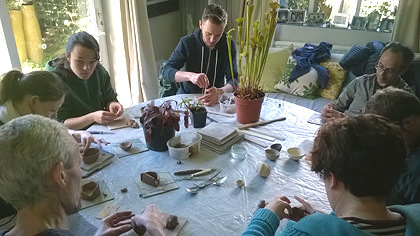 So the idea of the workshop was for the lab to experience working in clay and to realise the sort of forms they know from the laboratory. This was an interesting visit by Renata Bonter-Jędrzejewska from the Eugeniusz Geppert Academy of Art and Design in Wrocław, Poland. She is working on the creative potential of new ceramic structures made with the use of digital technology. I tend to work within the limitations of my technique. This conversations was more about what could be done with the technology and where might it develop. 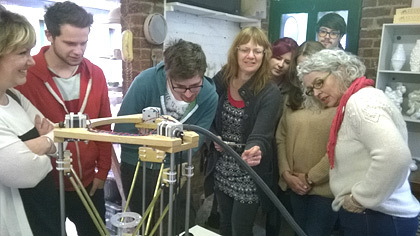 Students from the Colchester Institute Craft course initiated their own studio visit. A sign of the times when the more fees you pay the more you have to organise your own events. 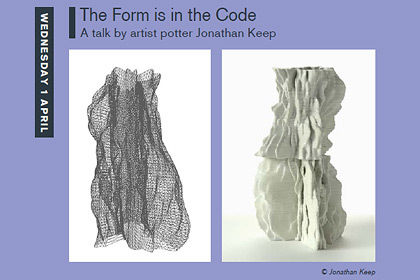 The group where fascinated by the way that while I am inspired by natural patterns and systems I use computer code to mimic these processes both in my drawings and my ceramics. The Italian WASP group has given me one of their DeltWASP printers to try out with the retracting printhead and it works really well. With my own design of printer the extrusion of clay is continues so a form will have no holes in it or unconnected elements. With this printer, in the printhead is a small auger screw powered by a stepper motor that will switch on and off the flow of clay. The clay delivery is much more precise and more complex shapes can be made. The printer is bigger too so I am working on larger pots - 40 cm high. It was good for a change to be invited by a Contemporary Art Society to talk about my work so I could concentrate more on the content and artistic ideas behind my pots. The talk seemed to be well received by a large crowd. 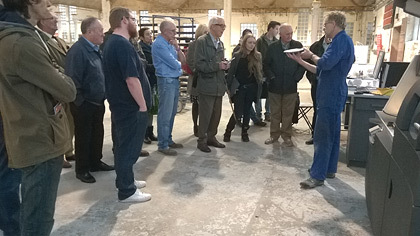 Questions afterwards were, probably not surprisingly still centred on the use of 3D printing as I guess it is not a very common technique for a potter to use. It did avoided the tiresome debate as to whether pots are art or craft. 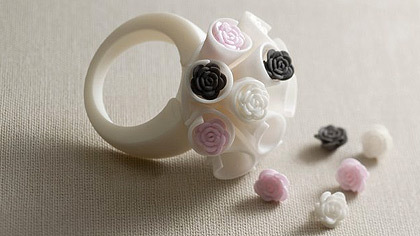 I am interested to see how ceramic 3D printing will get incorporated into everyday studio practice. This video shows how I am producing coffee cups with the self build clay 3D printers. 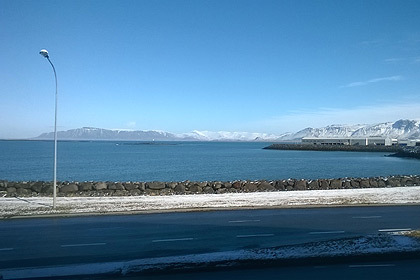 Thanks to Flemming Tvede Hansen of the Danish Design School for recommending me when Olof Erla Bjarnadóttir of the Myndlistaskolinn, Reykjavik enquired about a ceramic 3D printing workshop. 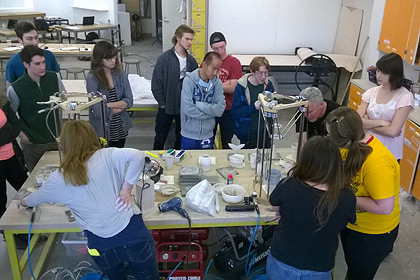 I did an introductory workshop to the two years of the Icelandic school's ceramic design department. Taking one of my printers we used the Blender software as a 3D modelling program. Working with students who have little experience of using digital techniques a lot of the workshop is spent learning to use the modelling software. However students very quickly see how the software can be used as a creative tool with new possibilities and as their virtual forms are realised as physical clay object there is always great excitement in the room. 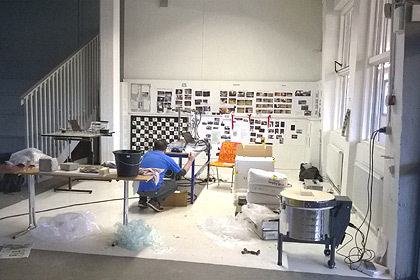 A ceramic department studio room with one of the finest views I have come across. 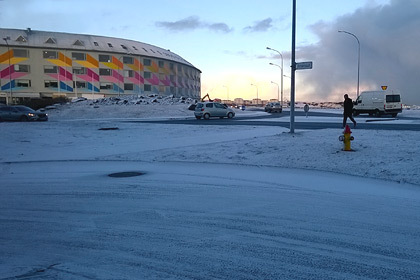 The school is now looking into building their own ceramic printer and I am sure before long computer controlled coil building will be a technique on offer in Reykjavik. 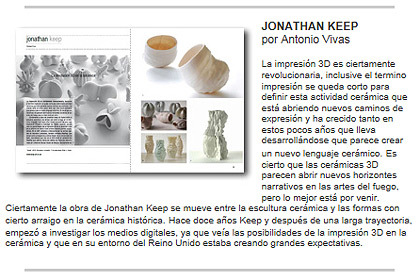 The current issue of Spanish language ceramic magazine Revista Ceramica has an article on my work. Invited jointly by the ceramics and the emergent digital practices departments of the School of Art and Art History at the University of Denver this was an ideal combination for me. 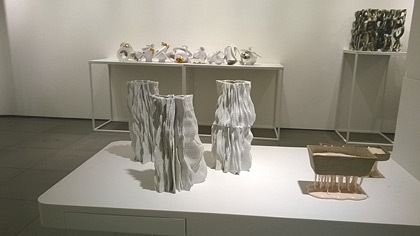 It was a good opportunity to promote the growing interest in digital techniques being used in ceramics and the exploration of materiality and making in the realm of digital practice. 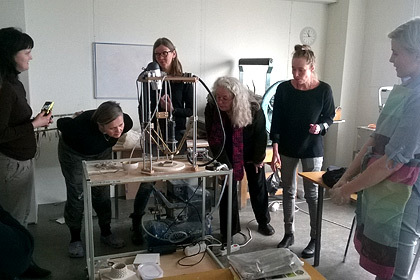 Initiated by ceramic artist and associate professor Mia Mulvey my visit was in support of the experimental class Mia offers exploring digital technologies in ceramics. Having already set up a CNC router to mill digital files to produce moulds for slip casting Mia wanted to also offer 3D printing to the class. 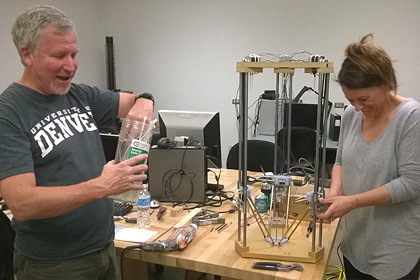 So with Timothy Weaver, associate professor in the digital practice department we built two ceramic 3D printers. 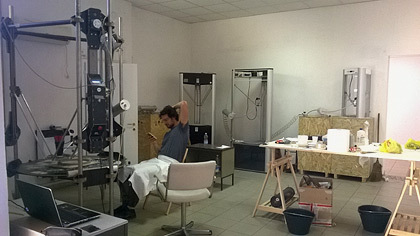 A big thanks must also go to MFA student Jenny Filipetti who sorted out the electronics on the machines. This was an ideal working situation, moving between the two departments and I hope hope it can be developed further. 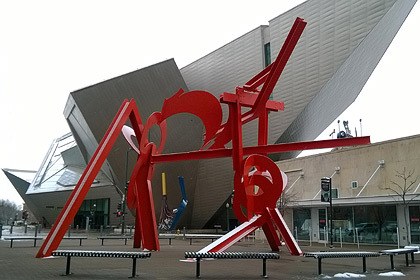 While in Denver I did not want to miss out on visiting the Denver Art Museum and I was not disappointed. The mix and quality of works from cultures around the world is extraordinary and I was particularly pleased to see the fine American Indian collection. 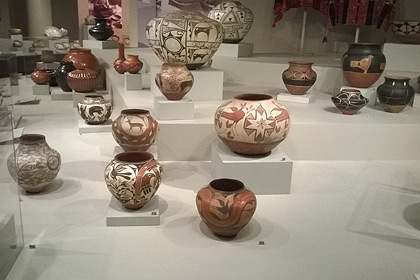 The Pre-Columbian collection is also very special, notably the South American ceramics. For part 2 of the glass clay collaboration (see part 1 below) we took up residence at The Glass Factory Museum in Boda, south eastern Sweden. 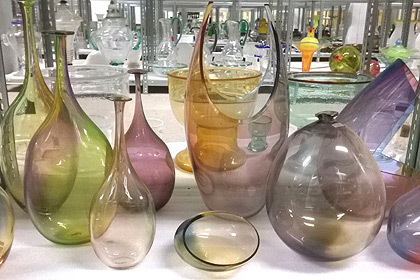 Promoted as one of Scandinavia’s largest glass museums it holds extensive historical glass collections from Boda, Kosta and Åfors glassworks. 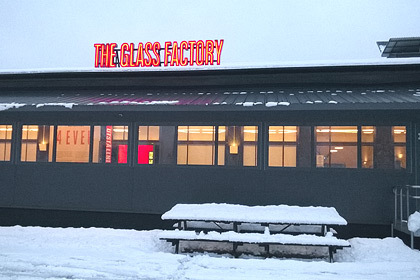 The vision of museum director Maja Heuer is that the museum and studio serves as a knowledge centre and creative meeting place for artists, designers and visitors – The Glass Factory as an experience-based, interactive glass museum. Over the Christmas break glass artist Charlie Stern, designers Dries Verbruggen and Claire Warnier, and myself had been reflecting on how we could develop the experiments we had undertaken in December at Konstfack, Stockholm and produce a series or batch production run of glass clay objects. Initial plans were to produce a jug and bowl set that in the process of making required reheating in the glory hole – the glass furnace to finish the rim and form the jug spout. Then also a vase form, where moulds would shape the blown glass bubble in the base and neck offering a controlled profile with the body ring of printed clay. With the vases colour was introduced, taking into consideration the brilliance and translucency of the glass set against the natural fired colour and earthiness of the clay. The number of breakages we got when reheating the clay in finishing the jug and bowl sets proved to be unviable as a production method and this line was abandoned. The making of the vase forms was much more successful but better quality moulds would be required for long production runs. With the deterioration of the neck moulds it was decided to allow the glass bubble to naturally fill out above the ceramic body ring offering a variation on the original vase design. Initiated by Swedish based glass artist Charlie Stern this was a collaborative project involving Charlie, Belgium design due UNFOLD and myself. The overriding intention was to explore what happens when traditional making is enabled by digital networks. 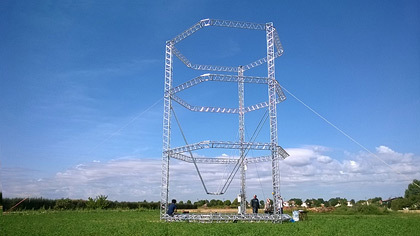 To demonstrate how digital fabrication is being adapted to suit the needs of craftspeople and how the practices associated with digital technology can influence the process of making and to look at the impact of digital tools on hand craft. Concentrating on blown glass and ceramic 3D printing our time was divided into an initial period of research and development at the Stockholm Design School, Konstfack and then a part 2 focusing more on production at the Glass Factory Museum in the south eastern Swedish region of Småland, renown for glass blowing. 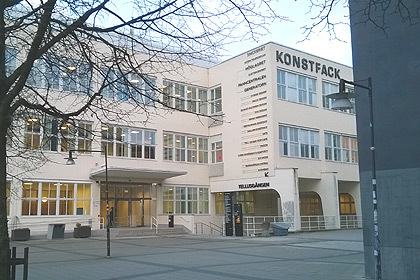 With access to the ceramic and glass facilities at Konstfack our starting point was to look at using 3D printed ceramic forms as moulds to blow glass into. This developed into rather combining the ceramic and glass to become a single form, seeking to retain and enhancing the inherent qualities of each medium. Plaster and silica moulds were used to control the base of the blown form while numerous clay mixes were tested to find a body that would withstand the thermal shock of the process.